Anything a kayak can do a SUP can do better, right? Wrong. But that’s actually a plus for whitewater river running on stand up paddle board. You can have more fun on smaller rapids and with lower water levels on a SUP than on a kayak. Sup boards for whitewater will never take the place of kayaks but they do have their own special place. In the off season you normally tuck your play boat into bed but your river SUP board will be raring to go. Navigating rapids is hard, doing it while standing up is harder. Some might say it’s silly and it definitely looks insane. 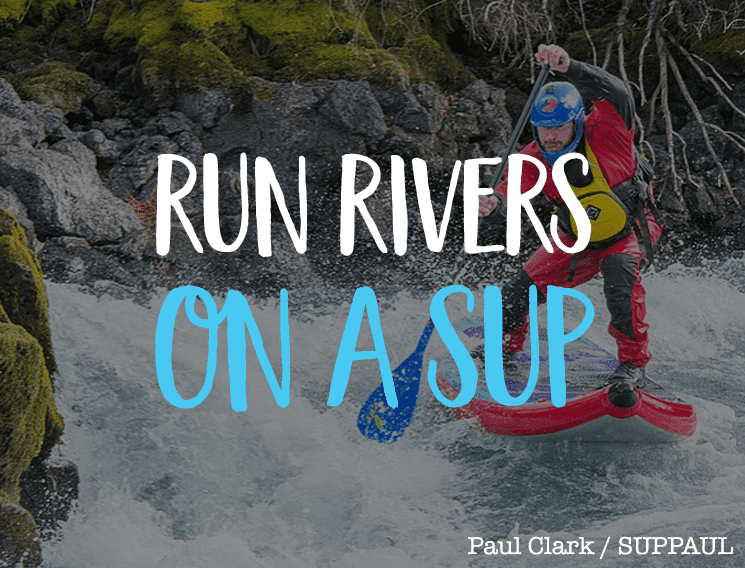 Even if both are true it is insanely fun and if done with care it’s a great way to expand your river running repertoire. If you love the water and you want to be on it in all seasons, don’t knock whitewater SUP. Even you, grizzly kayaker, can find enjoyment on a river SUP. In fact the level of ego-free enthusiasm around this sport is pretty refreshing to many. 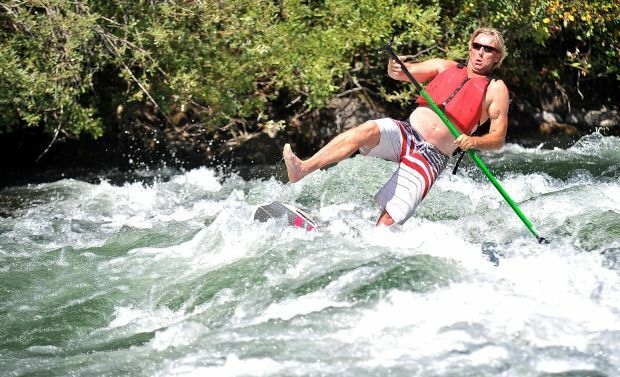 SUPs on the river have their own unique appeal. And with this appeal comes a unique set of pros and cons. 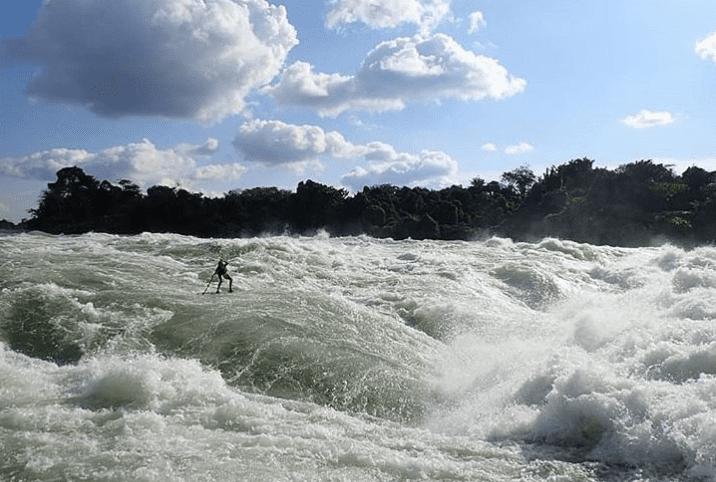 Whitewater paddle boarding is dangerous as is any adventure sport. Part of the appeal comes from taking risks but that doesn’t justify outright carelessness. Safety is important whether you’re standing on a board or sitting in a kayak. Swiftwater protocols still apply if you need help. Rescue on fast-moving water is both dangerous and highly technical. Not only will you be at risk if you bite off more than you can chew, but so will the person coming to save you. Self rescue principles are absolutely essential. This is especially true if you intend to paddle alone (which you shouldn’t), remotely or on more dynamic water. You’ll fall in sooner or later and how you do it counts. If you spread out your mass your fall will be shallower. The less time your head is below water the better. The best paddle board for river running depends on what you want to do. Short, wide boards are great for tricks at a park & play spot. They are not much fun to paddle any distance on a flat. How specialized you go should depend on what is realistic for you. The obvious advantages of inflatable boards apply here as much as ever. They are lightweight, easy to carry and easy to store. You can travel with them by plane or car and hump them down to the river easier than a hardboard. iSUPs are uniquely suited to river running because they absorb contact with obstacles so well. You won’t scratch or ding them (aside from the fin) and they are near impossible to pop. Modern drop stitch technology makes for boards so rigid, you won’t notice they’re filled with air. For the sake of versatility, the ideal board isn’t cumbersome to paddle on a flat but can stand up to small rapids. Go for width over 30″ but maintain at least 10′ of length to have the best of both worlds. The extra width will provide stability, keeping the length will allow you to paddle the board easily on calm days. Inflatable SUP yoga boards are great for casual river runs on ankle biting waves. Inflatable boards with multiple chambers offer higher rails. Higher rails make for outstanding secondary stability when you need to lean the board hard. For tricks and your best shot at punching holes hard, go for a short board under 9′ with added width. Your gear is determined by the conditions you paddle in. 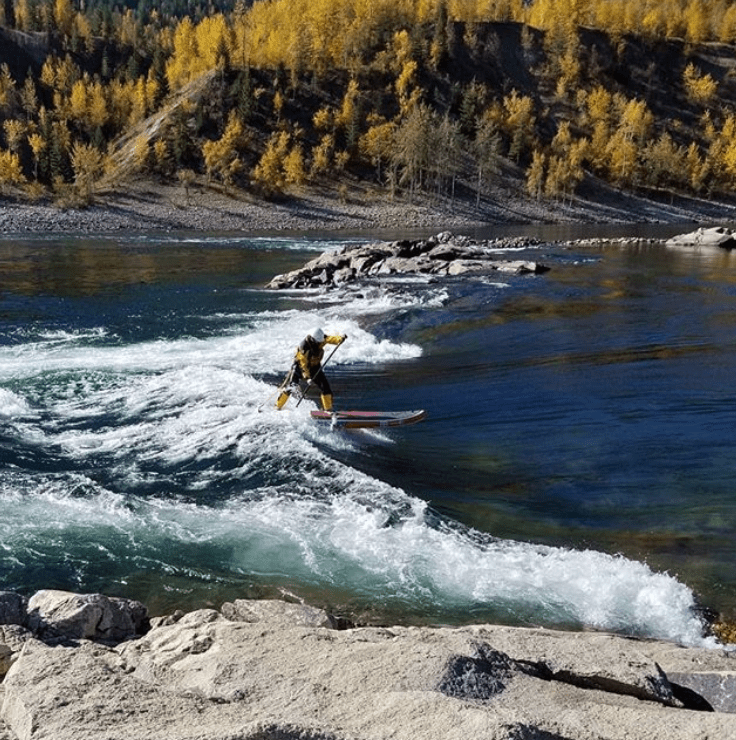 Whitewater SUP is often found in places where the water is chilly year round. When you get dressed, take into account temperatures both in and out of the water. This might make for sweaty paddling if you don’t fall in but it will keep you safe in the event you do. Base layers wick sweat away from your body to keep you dry in all conditions. When it’s chilly, this wicking of sweat also keeps you warm. Base layers under a wetsuit are possible so long as they are thin. They shouldn’t impede the insulating layer of water that the suit is meant to hold. Smart wool is an ideal base layer material, especially for winter. It doesn’t stink, it comes in multiple densities and it dries quickly. Although it is wool, it’s still comfortable against the skin. Wetsuits keep you warm in the water. They are essential even if you don’t intend to fall in. In fact, with any winter watersport you should always dress to survive the water you’ll be playing in. Water wicks warmth from your body far quicker than air. The thickness of the wetsuit you buy is determined by the conditions you’ll be paddling in. Colder water, thicker wetsuit. The only times you really don’t need one are when paddling in extremely warm water or when wearing a dry suit. Ideally you’ll be staying above rather than in the water. Outer layers for rain and wind should be factored in, just be sure they won’t hinder you from swimming. Wear things that tear off easily and don’t weigh you down. A 750 fill puffer jacket may be toasty, but not much fun for breast stroking to shore. Dry suits keep you at it when the weather gets cold and gnarly. That means paddling all through the winter if you can stomach it. Another advantage to the dry suit investment is that falling in won’t ruin your day. If you know you’ll be warm and dry no matter what, you’ll be able to push it harder on the river. Although they are expensive, aside from your board they might be the single most game changing piece of gear you buy. Depending on the climate in your area and your inclination to keep playing in all seasons a dry suit may be worth it. River running is inherently risky. The presence of rocks and obstacles to smash into is inherent to the sport. Find a good helmet that is comfortable because your cranium is worth it. You can find budget helmets for whitewater, but if you’ll be on the rapids often it’s worth shelling out for something higher end. If you’ll be paddling in warm weather, get something lightweight and vented. For cold water paddling, you can go for a heavier helmet that keeps your head warm. Neoprene gloves and booties are a good choice for keeping hands and feet protected. You can find these at scuba and sailing gear retailers. River shoes that drain are also a great choice because they’ll hold up for portages along banks and over rock. Be sure booties are snug enough to keep warm while allowing space for a sock liner. It’s worth trying a couple of pairs of gloves to find what is comfortable for you, paddle in hand. Thicker gloves are warmer but reduce dexterity so find a happy balance for the conditions you’ll paddle in. As with all gear, what you choose will be influenced by the climate. Keep yourself tied to your board and afloat. These 2 pieces of equipment can easily be the difference between a hospital visit and an après sup beer. Your PFD should allow you to move easily while providing enough buoyancy to help you stay above water. Specialist versions for whitewater will be most comfortable. They also pair well with quick release leashes so you can attach yourself board to PFD rather than calf to board. As with all things SUP, part of the magic lies in the accessibility of the sport and positive attitude of the community. Don’t approach your first rapid alone, find a local guide or a school to learn basic skills like ferrying and how to navigate eddies. Making it social is safer and also helps you learn new skills. More skills and safer paddling mean less chances of watching your teeth float down the river. We’d love to hear about your experience with river running either learning as a beginner or crossing over from kayaking. Share in the comments below! SUP Paul runs a fantastic site with more information on whitewater SUP than you’ll find anyplace. Paddling.com has a valuable library of self rescue techniques. This entry was posted in Stand Up Paddleboarding, SUP Tips. Bookmark the permalink.